The SFVOS will be holding their annual Orchid Auction on the first Wednesday in April. The doors open at 7:00 pm so that bidders can preview the beautiful plants before the auction starts. The bidding will start at 7:30 pm, and we will go until we run out of plants. Refreshments will also be served. We are very pleased to announce that Doug Overstreet has graciously agreed to be our auctioneer again this year. 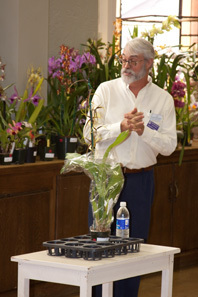 Doug is very knowledgeable about all orchids as as each plant comes up for bid, Doug gives us a brief description of each plant and describes the type of environment needed for that orchid to thrive. If you haven’t seen Doug in action, you must come and learn from his vast wealth of knowledge. This auction is our major fundraiser for the year, some come out to help support your society. It is a win-win situation as this is your chance to add some great orchids to your collection at bargain prices, while helping the SFVOS fund it’s various activities throughout the year. Come early to get a good seat and have enough time to check out all the orchid plants that will be put up for bid. The auction will be held at the Sepulveda Garden Center, just like our regular meetings. For the address, directions and a map, see the home page of this website. You don’t need to be a member of the SFVOS to attend. Guests are always welcome. Plan to attend this great auction and bring a guest! See you there. Vandas are impressive orchids that are relatively easy to grow. Vandas are monopodial, which means that the new leaves grow from the crown of the plant. This means the vanda is continually getting taller. 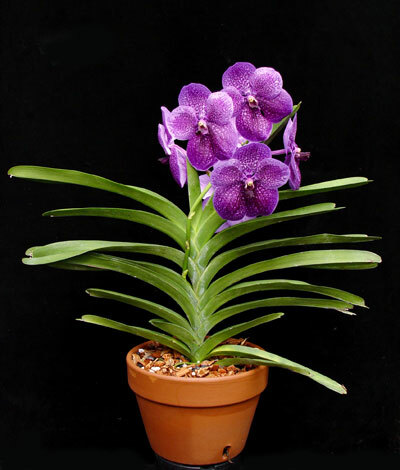 Vanda flowers come in beautiful and superbly vibrant colors, including purples, blues, reds, oranges and yellows. The flower spikes are very long and they usually have 8 to 10 blooms, which are located in a cluster at the end of the stem. The flower stem grow from the base of the leaves and can last for several weeks. The long, heavy, flower laden stems can sometimes make the plants difficult to hang up and display at Orchid Shows or in your home, and may require additional support during blooming. Vandas need an abundance of light. They like either bright morning sun and/or late afternoon sun, providing the sun exposure occurs gradually. The plants need to adapt slowly to the any increase in lighting. A good tip is to provide full morning sun whenever possible. You don’t need a greenhouse to grow Vandas. Any outside location with bright morning light will do, but be careful while making the change to brighter light. Try not to expose it to direct sun on the leaves, just bright light. Move it gradually, over the course of several weeks, into brighter and brighter light and be careful to do it a little at at time. I had my first Vanda for five years and it never bloomed. I didn’t know what I was doing wrong. It seemed healthy but wasn’t flowering. I was fortunate that at one of our SFVOS meetings, there was an expect who shared his knowledge about Vandas and explained to me that Vandas are happiest when they get very bright light. The very next day, I moved my Vanda from the east side of my greenhouse to brighter west side of the greenhouse and I hung it up from the rafters at the top. I am happy to report that since moving my Vanda to brighter light, it has bloomed three times in the last year, and each bloom is more beautiful than the last. Vandas prefer to be kept on the warm side. Vandas do best when when the nighttime temp is between 55 to 70°F and when daytime temperatures range between 65 to 95°F. 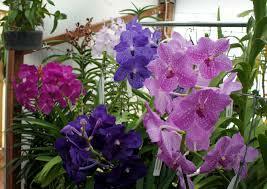 The general “Rule of Thumb” for watering Vanda should be: Hot temps = more water, and cooler temps = less water. My Vanda is growing in a wooden cage with the roots all flowing out. Some of the roots are 24 inches long. I have very little potting media in the cage, and most of the roots are loose and free, but many of them have attached themselves to the wooden cage itself. I generally water mine about once a week, but when the temperatures are over 95 degrees and the humidity is low, I give it a daily shower. Remember that Vandas grown in baskets, without potting media, require more frequent watering. In baskets, they may need to be watered daily during the summer. Always allow your Vanda to dry out between waterings. Try to water the plant early in the day, so that the foliage will be dry by nightfall. If you are growing your Vanda in a greenhouse, and the humidity is constantly high you can use Physan 20 once a month (add it to your water) to prevent bacterial and fungal disease. Although Vandas generally prefer 60% to 80% humidity, I can report that my greenhouse almost never has humidity this high. If you can increase the humidity during the growing season, from early spring through late fall, your Vanda will thank you for it. During the summer, watering should be supplemented with daily misting of the leaves. Humidity trays may be needed if your Vandas are growing indoors. Vandas are heavy feeders. They must be fertilized on a regular basis! For best results, use nutrients every week. The experts recommend that you water the plants first with plain water, and then water the plant with a 1/4 strength nutrient solution. Once a month water only with plain water to flush out any excess fertilizer. 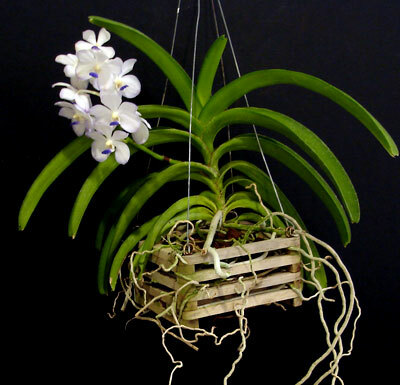 Vandas may be grown in a medium to large sized Orchid Bark Mixture or you can grow them in wire or wooden baskets, which can then be suspended (hung up) by a wire hanger attached to the cage. Plants grown in baskets do not need to be repotted often as those in pots. Vandas grown in regular potting mix in pots should be repotted once every two years. Repotting should be done in the spring. It is almost impossible to extract a vanda from a “basket” or “cage” once it has become attached to it. When my vandas outgrow their smaller “baskets” I generally leave them in that basket and just place the entire small basket inside a larger basket. I carefully thread the roots through the holes of the new basket and try not to damage the roots as much as possible. One of my Vandas which is currently in an 8″ square wooden (redwood) cage has three smaller “cages” inside the basket from prior stages of its life. It does no harm to leave the old basket(s) there if they are in good shape and not starting to rot. If your Vanda’s home “Basket or cage” begins to rot (which may also mean that you are overwatering) then you must re-pot for the health of the plant. You will need to extract the roots as carefully as possible before re-potting it in its new home. Soaking the roots for a couple of hours before attempting this will soften the plants roots and make it easier for you to handle them and try to get it out of its old pot. Take your time, and save as many roots as possible. Even if you lose a few roots, the plant should rebound and adapt to it’s new home in no time. Vandas are becoming more available to hobby growers and can usually be found for sale at Orchid Shows and they are also available for purchase from many Orchid Growers websites. You will probably want to start with a smaller specimen, as they are much easier to transport and would be much less expensive. Your Vanda may need to get a bit bigger before it will bloom. Your patience will be rewarded with a spectacular show of flowers. PESTS Common pests associated with Vandas are scale and spider mites. Check your plant often to make sure it is pest free. Check our section on pest control if you notice any “freeloaders” hanging around your plant. Vandas hung up from the rafters and/or suspended are much less likely to get pests. Best of luck with your Vandas and enjoy the spectacular blooms. Orchid Collection Donated to SFVOS by the Tom Family of Eagle Rock. The SFVOS was the recipient of a very generous donation of over 100 Cymbidium Orchid Plants by the Estate of Mr. Yee Quon (“Jack”) Tom. Jack Tom passed away on May 23rd, 2013. Jack loved his orchids, and at one point had over 300 Orchid plants in his collection. He took meticulous care of his prized collection and there were always blooming orchids in their beautiful hillside home in Eagle Rock. 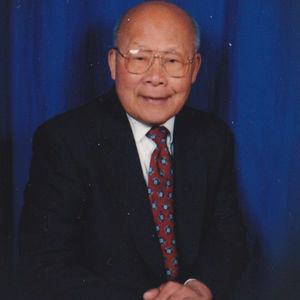 Jack Tom was born eldest of seven in Guangdong Province, China on August 24, 1925. At 19, during China’s conflict with Japan, he left home to pursue his goals and ambitions. He was employed with various government agencies including Yuebei Iron Factory Accounting Department, Quijiang Wushi Training Department, and the Yangjiang County Taxation Department among others. After WW II, he worked in the Cashier’s Division at Guangzhou’s Sun Yet-Sen University. Mr. Tom arrived in Los Angeles in 1951 to work at his father’s restaurant. In 1956, along with friends, he opened the Taoyaun Restaurant in Chinatown. In 1958, he returned to Hong Kong to marry Dora Chan. The newlyweds returned to Los Angeles to start a family. After the closure of Taoyaun Restaurant, Jack was employed as the chief chef at the famous Kowloon and Wan-Q Restaurants on the Westside. After 40 years in the restaurant business, Jack retired to focus on fruit trees and cultivating orchids. He especially enjoyed reading, listening to classical music, watching NBA basketball, and recreational cooking. In life, he always treated others amicably, with friendship. He took care of his wife, sons, and siblings with love. Jack believed he lived a good life, with a virtuous wife, with filial children, and experienced happiness and longevity. He is survived by and missed by Dora, wife of 55 years, his sons Stanley and Homer, daughter in law Joni, grandson Nathan, and his remaining brother and sisters in the U.S. and China. We would like to thank the Tom Family for their generous donation. I am sure Jack would be pleased to know that his beloved Orchids will be adopted and cared for by the members of The SFVOS. 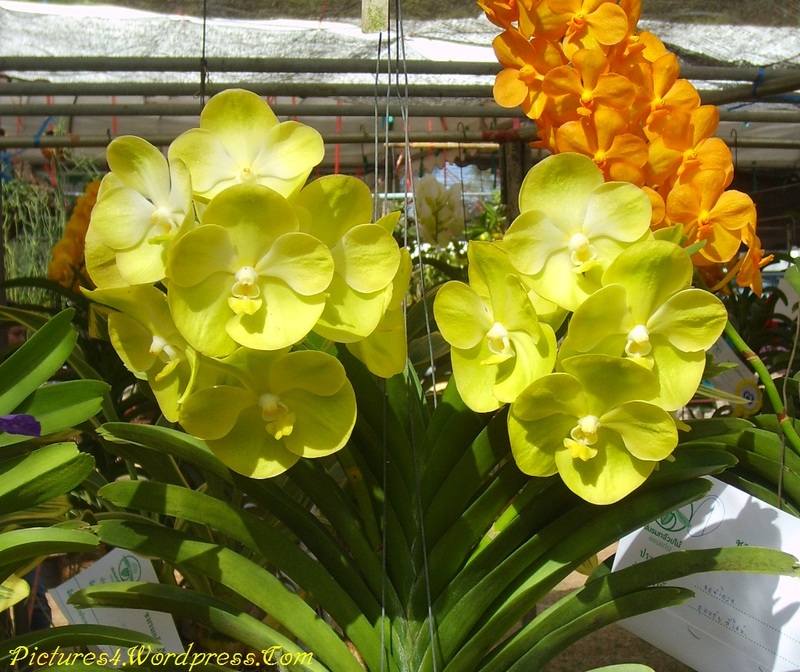 If you would like to see a slideshow of Mr. Tom’s beautiful orchids, please visit http://www.tributes.com/show/95870991# and click on the photo of Jack then select “Jack’s Orchids” from the photo albums available under the main photo. 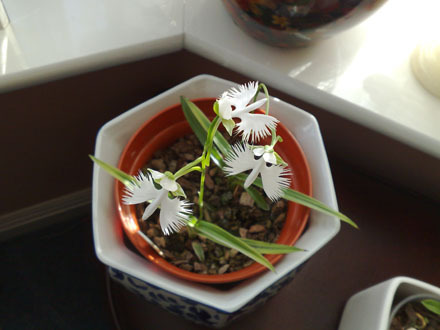 Habenaria radiata is a small terrestrial orchid that grows in grassy wetlands throughout Japan, the Korean Peninsula, Russia and some parts of eastern China. It is commonly known as the White Egret Flower. It is also sometimes referred to as the Fringed Orchid or Sagiso. This orchid’s flower indeed looks much like a Snowy Egret with its wings wide open. Japan is home to many snowy egrets and they often share the same habitats with this little flower. This rare orchid has recently gained recognition around the world for its beauty, but ironically this species is now considered imperiled in the wild. The leaves are similar to grass blades, between 5-20 cm long, and about 1 cm wide each. New leaves form every spring. Flowering commences in late July and peaks in August. The flower stalk holds anywhere from 1 to 8 flowers, each being around 4 cm wide. The lip, as well as the petals, are pristine white, whereas the sepals are small and greenish. The plant grows from a small underground tuber, no more than a couple centimeters long, Because this plant is deciduous the tuber serves as an energy source early in its growth cycle, allowing new leaves and a flower spike to form. This species is in rapid decline over its entire range. Over collection may be a contributing factor, but for the most part the loss has been due to habitat destruction. In the distant past these plants grew in lowland bogs and marshes in the same areas where rice patties were later situated. Rice cultivation rapidly increased, taking more and more of the unique habitat, which was then followed by urbanization, and in lowland areas this species became more and more rare in the wild. Nowadays, Habenaria radiata exists mostly in upland bogs and seepage slopes in moderate to high mountains (over 500 meters elevation). Because these areas are not considered suitable for agriculture this plant (along with other rare plants) has found its last remaining habitat in modern Japan. While it still can be found on all of Japan’s main islands it is endangered throughout its entire range and is completely gone in some areas. Most experienced orchid growers find it quite difficult to keep for more than a season or two. This orchid requires conditions not easily duplicated outside it’s natural environment. Because this orchid is endangered one would hope that orchid growers would recognize the need to stop collecting them from the wild so we can keep as many of them alive in their native environments. We should be grateful we can enjoy these orchids vicariously through photographs, and hope we can preserve these unique and beautiful orchids for generations to come.